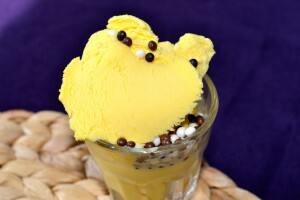 This is the passion fruit ice cream from David Lebovitz’ book The Perfect Scoop. Something I discovered whilst making this – my teaspoon measurement spoon is ideal for scooping out the passion fruit pulp and seeds. I’ve had so much difficulty in the past figuring out how to eat passion fruit, as the rest of my spoons never seem to be able to extract anything in a non-messy manner. I also appreciated the tip that the uglier the passion fruits are – the more mature and better they taste. My store had put the ugly ones on top, and the nicer-looking passion fruit on the bottom, and I would definitely have gone for those on the bottom if I hadn’t read the recipe beforehand. It tastes pretty good – but I keep expecting it to be a sorbet instead of an ice cream. Next time I make something with passion fruit, I’ll probably find a sorbet recipe instead. No fault of the original recipe, just my personal taste.